A Butterfly Soul on Fire. This is a fictional short story by Jerry L. Winslow II. When she woke up from her slumber she felt very groggy and in some way different. She was weak and wasn’t sure what had happened. She knew her name was Selena but her memory of her life was foggy and coming back to her slowly. When she looked around she could see nothing but white. She reached out weakly and noticed that she was wrapped in something soft. She could see better now and her strength was coming back. Pushing on the white material it seemed to stretch. So she pushed and shoved until it started to break open. The light was so bright; she stopped and wondered if she should just stay for a while. After sitting for a few minutes or maybe an hour she had a weird burning in her heart and saw a vision of a tall lady with blond braided hair. Selena found this quite disturbing and wasn’t sure what this meant. She decided that she must be going crazy from sitting in this white thing for so long so she decided to try to get out again. She pushed and pushed until she was weak again but she could see out now and her eyes were starting to adjust to the brightness. As she stared through the light she could start to see a world. A world that was ginormous. She waited there staring at the world that looked so big and while she did she had another burning in her chest and saw a vision of little girl in her mind that was no more than maybe 14, with brown hair and looked very similar to the blond haired lady she had seen in the first vision. This must be the woman’s daughter. Thinking that having two weird burnings and these visions was definitely not a good thing. Selena pushed her way out to breathe some fresh air and to clear her head. The air was warm and the sun felt great on her face. There was a gentle breeze that carried the scent of freshly bloomed flowers. She looked at her arms, or what she thought should be arms, but they were legs instead. When she looked to the left and right she noticed great big colorful wings. This is strange she thought. The wings were wet and a little wrinkly, and did not seem to work yet. As she stood there waiting for these new wings to work the burning in her chest took over again and this time she saw a grey house, the woman was walking up to the door. They rang the doorbell and a young man that had many of the same facial features as the blond lady came running out and hugged her, lifting her off the ground. When Selena came to she noticed that her wings looked bright and shimmered in the sunlight. She decided to give them a try again. With a quick flick of her new wings she lifted into the air. It was an intoxicating feeling to be flying. As she fluttered around she began to think about all the things she had been seeing in her visions. She deduced that the young man and the blond lady must be related like brother and sister. As she flew something very strange happened to her. The burning came back but this time it was dull and she started seeing a vision, but she could see through it into the world she was flying through. It started with the woman and her brother but now they were very young. She was climbing on a shelf to get some cookies. When she got down her brother was waiting with a bag of flour and some oatmeal which he dumped on her as soon as she touched the floor. They both just sat there after playing in the mess that was made. Selena thought this a very weird way to play together but it seemed very familiar to her. She was thinking this would be the end to this dream but it just kept on going like watching a video. She found a nice warm air current that just carried her while she focused on the continuing dream. At first it was just the two of them going on many adventures together, but then there was another brother and then another and another. Selena thought this is going to be horrible for the girl, being with all these boys all the time, but they all got along so well. They built forts together and went on many treasure hunts. At one point the children hid a box in the ground with stuff in it and Selena thought she knew exactly where it was hidden. She had the feeling she could fly right to it and dig it up, but she dismissed this thought because she didn’t know who these people were. She continued floating in the warm current watching the story of this lady unfold before her eyes. It seemed to skip a few years because the little blond girl was now a teenager. Things seemed to have gone sour now that the girl was a little older. The brothers and her didn’t go out and explore anymore. They didn’t seem to do anything together at all. The brother that hugged her from her earlier vision didn’t live in the same house as them anymore. He would go over to visit them and stay for a few days. He always met her with a big hug. The blond girl started drinking things and smoking things that would make her act weird. Selena thought she knew what those things were, that the girl was doing, but she thought there was no way she could know. The girl started fighting other girls and doing things with boys that were strange. The older brother always seemed to be looking for the blond girl and taking her away from these boys’ houses and bringing her home to the rest of the family. Selena became frightened and wanted these visions to stop. So spotting a big tree close by, she landed. As soon as her feet touched the tree, the dream ended. She stood there wondering about this dream and wondered why she would be having them. It all seemed so familiar to her. Like she knew these people and had seen it all before. How silly she thought, it’s just not possible. She pushed off and took to the sky again. The dream started immediately. The woman was older now, an adult. Something was not right with the way she looked now; almost like she was afraid of something. The older brother would still go to see his sister and hug her hard, but he didn’t seem to see the fright in her face. Then Selena saw why the lady was so afraid. There was a man with her now. He seemed nice to everyone else but at night he would hurt her. She watched as the man hit her and then handcuffed her to a door. Selena was paralyzed from the pain of seeing this. She looked through the vision to the world she was flying in. She wanted to help the woman, to do something to stop the man from hurting her. Maybe if she could get the brother surely he would stop this madness. But then she thought, it’s just a dream and even if it wasn’t she doesn’t know how to find the brother. The story continued to unfold and Selena flew on. The man continued to hurt the lady. He hit her and dragged her by her hair; he started to hit the ladies daughter too. The daughter told the woman’s brother and he went to get his sister away from this horrible situation, but she would not leave. She was crying and hugging the older brother but no matter what the older brother said, she would not leave. Everything this lady felt seemed so real to her. She started crying and couldn’t stop so she landed on a piece of grass to let the feeling pass. When she landed the dream stopped, but her crying didn’t. She couldn’t imagine someone putting themselves through such pain. When she finally was able to get her composure back, she noticed there were some people in the field she had landed in. When she wiped her eyes she was able to see that one of the people was the brother from her visions. She stood on the grass watching him. He was playing with three little boys who appeared to be his children. They ran around the field chasing each other with wild excitement. They seemed to be having a very fun time. Selena couldn’t understand why he would be so happy if he knew his sister was in such trouble. As she watched them run around she realized she knew the names of the boys. She heard the brother holler their names. She was right she did know them. And then it all came to her. She knew all the people in the visions she had been having. She knew the daughters name. She knew her whole family. Everything the blond lady had done her whole life, Selena knew. It was all so painful and frightening. She looked at the older brother again and yearned for his hug. She missed him so much she couldn’t bear it. Selena took off from the piece of grass. She needed to be with her brother. The pain in her chest came on hotter now than ever before but Selena pushed on, shoving the pain and the visions away. If she could just get to him she would be okay. When she got about half way to him something snapped in her mind and she realized that she is the blond lady. The burning in her chest was unbearable now, but she pushed on. The visions pushed through stronger now. She saw herself getting beat again but now she could feel the pain of it all. The man that beat her was her fiancé. Even though he beat her, Selena could still feel her love for this man. Her fiancé handcuffed her but then he took it off. He had her kneel in the bathroom facing there vanity. Selena was crying with fright now. She couldn’t see through the tears to get to her brother she needed to land and hopefully it would all stop. She landed on a dandelion hoping this horrible nightmare would stop, but it didn’t. The burning continued and dream kept going. Her fiancé had put down plastic and sheets on the bathroom floor which scared Selena even more. She knew what was going to happen. He yelled more and more ranting on about nothing just focusing all his anger on her. She heard a click sound and she knew she was in great danger. She knew he had a gun in a drawer next to the bed. She hollered in her mind while she knelt on the floor; she hollered for her brother, she knew he would stop this. She was so stupid to not have left with him when he tried to help her. Then she heard a loud bang. Selena couldn’t handle the pain in her chest, it was crippling her. The wind picked up and tugged at her wings to get her to take to the sky. 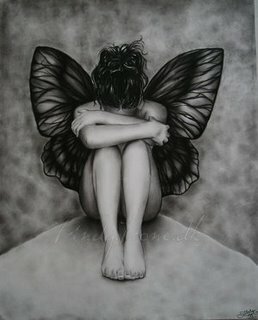 As the wind pulled at her wings the pain started to dull a little but every time it tugged at her wings her memories of her family would fade. She held on hard to her memories of them. She loved and missed them all so much. The wind kept pulling and pulling. Selena was so weak from the pain in her chest that she knew she couldn’t hold on much longer and her memories were almost gone from her. A final long gust of wind came and Selena knew this would carry her away. With the wind pulling hard and her last foot on the dandelion she whispered I LOVE YOU to her family and let the wind take her. As she was lifted into the air, the dream started again. Selena was looking at the floor then everything went black. The pain stopped and the memories of the person she once was were gone from her forever.